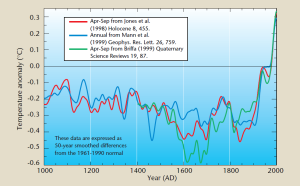 Today I will review the timeline of the above WMO 1999 graph in the light of the ClimateGate (CG) letters. The main events took place on Tuesday, November 16th, 1999. Things start rolling 9 AM (UK time), when Tim Osborn sends the new Briffa and recalibrated Jones (1998) time series to Phil Jones along with the suggestion to hide the decline. Twenty minutes later Jones writes to the MBH crew (cc Briffa and Osborn) explaining WMO plans and exactly what the graph will look like. I have just returned from my engagement at the National Press Club, sponsored by the Marshall Institute Roundtable. Washington, D.C. – Today, the Energy & Environment Legal Institute (E&E Legal) filed a formal referral with the Internal Revenue Service alleging the Sierra Club and the Sierra Club Foundation are in potential noncompliance regarding two areas of tax law: impermissible benefit to private interests and failure to pay taxes on unrelated business income. A detailed report authored by E&E Legal’s General Counsel David W. Schnare outlining the specific violations accompanied the IRS referral, which seeks the tax agency’s careful review and investigation into these potential tax law violations.